so dreamy, you can still remember where you wish to be. Courage isn’t jumping off a cliff in hopes you will survive. 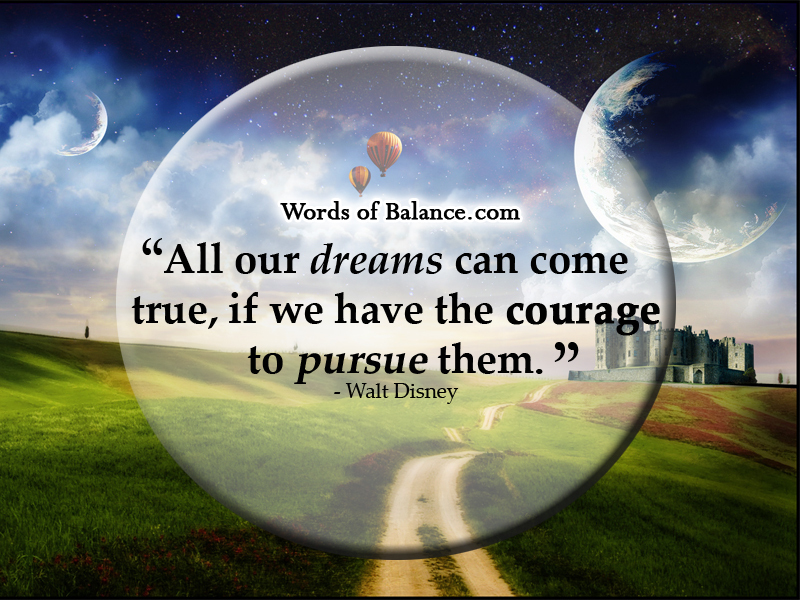 Courage is saying no to all the temptations for fun and excitement right now in order to one day be living your dreams. No one else but you has the courage inside to do what is best for yourself. The dreaming, wishing and planning for success is fun, the sacrifice today is not. The thrill of doing something new, starting out on an adventure and changing the course of history brings a rush of excitement and thrill. Admit it right now that the path to your dream will not always be what you wish it to be. The path to your dream will be a roller coaster. The quicker you accept this, the more manageable the dips become. Remember: If life did not have ups and downs you would be dead! Dreams can seem like a mountain from a distant plane. After driving forever they still look far away. “The 1,000 mile journey begins with a single step,” so does every dream we long to achieve. Make sure to take time to look back and see how far you have come. When you do, make sure to celebrate your progress, for these victories provide the fuel to keep you going until your dreams are achieved.